The American News Women's Club was founded on April 4, 1932, as the Newspaper Women's Club, with membership limited to women reporters and writers employed by newspapers. Today, the ANWC embraces a diverse group of journalists, independent authors and professional communicators. Its broader membership reflects an evolving news industry - particularly the increasing number of media outlets and growing diversity of news sources, and today's wider range of employment opportunities for women. 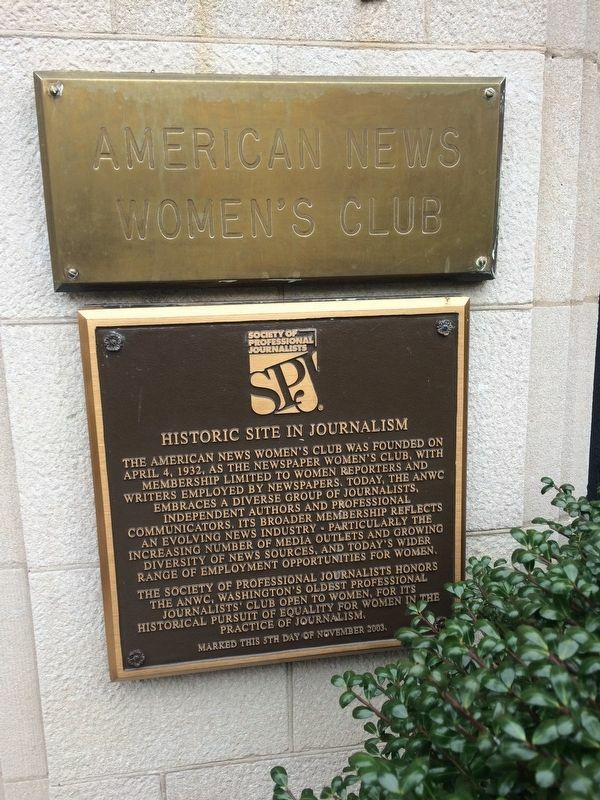 The Society of Professional Journalists honors the ANWC, Washington's oldest professional journalists' club open to women, for its historical pursuit of equality for women in the practice of journalism. Erected 2003 by Society of Professional Journalists. Location. 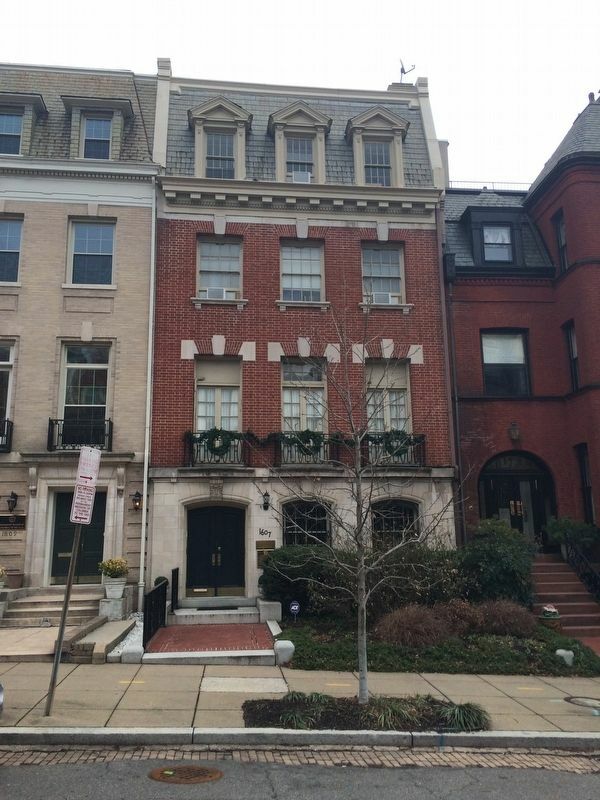 38° 54.726′ N, 77° 2.919′ W. Marker is in Sheridan-Kalorama, District of Columbia, in Washington. Marker is on 22nd Street Northwest north of Florida Avenue Northwest, on the right when traveling north. Touch for map. Marker is at or near this postal address: 1607 22nd Street Northwest, Washington DC 20008, United States of America. Touch for directions. are within walking distance of this marker. George Washington (within shouting distance of this marker); The Arts in Sheridan-Kalorama (within shouting distance of this marker); Alberto Santos-Dumont (within shouting distance of this marker); Liberation of the Grand-Duchy of Luxembourg (about 300 feet away, measured in a direct line); Tomáš G. Masaryk Memorial (about 400 feet away); Eleftherios Venizelos (about 400 feet away); Chief Justice Charles Evans Hughes (about 400 feet away); History of Sheridan-Kalorama (about 400 feet away). Touch for a list and map of all markers in Sheridan-Kalorama. More. Search the internet for American News Women's Club. Credits. This page was last revised on March 23, 2019. This page originally submitted on January 13, 2018, by Devry Becker Jones of Washington, District of Columbia. This page has been viewed 84 times since then and 8 times this year. Photos: 1, 2. submitted on January 13, 2018, by Devry Becker Jones of Washington, District of Columbia. • Bill Pfingsten was the editor who published this page.